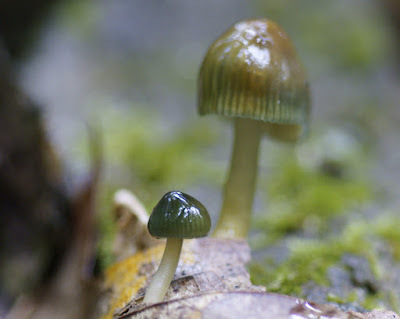 The West Virginia fungi series covers my two trips with my wife to the northwestern Monongahela National Forest in the amazing summers of 2012-13. Those summers produced an overwhelming amount of rain which made good for a vast diversity of species to be found. I have never witnessed to this day such a diversity of fungi species all in one weekend like that in my entire life of photographing them. I want to personally thank former OMS President–Walt Sturgeon for his lead on the area and perfect timing to this treasure trove of species. Without Walt's lead, I may have never encountered many of those species on just a regular trip out to West Virginia as many summers can be quite dry with little to no species fruiting. My wife and I love West Virginia and have also enjoyed helping out with the West Virginia Mushroom Club's excellent foray in 2013. They do these annually every year and have an excellent line-up of speakers and fungiphiles gather from all over the states and locally to enjoy the charms of the forest and bring further knowledge to others that love fungi as much as we do. So the next time the heavy rains arrive in the summer, you might want to plan a quick trip down there as it's well worth it!